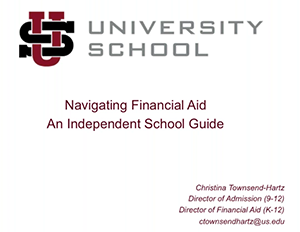 The Financial Aid Office at University School aligns with the mission of the school. We hope to provide deserving students an opportunity for an amazing educational experience that may otherwise not be obtainable. Our goal is that no worthy, mission appropriate student be deterred due to financial limitations. University School maintains a considerable financial aid program to ensure that the most qualified candidates have the opportunity to attend University School regardless of financial circumstances. The school is committed to having a diverse student body that reflects the broad mix of the communities we serve. Annually, US awards $5.8 million in financial assistance to 40% of students. Financial aid awards are solely grant awards. Applying for financial assistance has no bearing on the Admission Committee’s deliberations and its assessment of an applicant’s potential as a US student. CLICK HERE FOR INFORMATION ON HOW TO COMPLETE THE PARENTS' FINANCIAL STATEMENT, SUBMIT ADDITIONAL REQUIRED DOCUMENTS, AND IMPORTANT DEADLINE DATES. University School employs School and Student Services (SSS), a national program managed by the National Association of Independent Schools (NAIS) that collects and analyzes financial data provided by families. To determine eligibility and to apply for financial aid, go to sssbynais.org. For more information about our financial aid program, please call or email Christina Townsend-Hartz. Does University School offer financial assistance and scholarships? We maintain a considerable financial aid program to ensure that the most qualified candidates have the opportunity to attend University School regardless of their financial circumstances. What is the schedule for making tuition payments, and are there payment options available? A registration deposit of $2,000 (financial aid students $500) is due at the time of signing the Enrollment Agreement. The registration deposit will be applied to the student’s account balance for the 2019-20 school year, but will not be refunded if he does not matriculate for any reason. Students re-enrolling are not required to pay a registration deposit. Parents choose one of the payment plans offered through Smart Tuition: 100% payment, two 50% payments, a 10-month payment plan or a quarterly payment plan. For details, please refer to the University School Financial Information sheet. Any incidental charges applied to the student's account will be due by June 1. For more information, contact Paula Russo in the Business Office at prusso@us.edu. What are the tuition and fees for the 2019-20 school year? What are the terms of the financial aid program? Financial aid awards are for one year. Failure to comply with financial aid deadlines may disqualify a student from receiving aid. Misrepresentation, or failure to disclose completely all information on the Parents’ Financial Statement, will result in the loss of financial aid. Every financial aid application will be reviewed on an individual basis. Our guidelines are meant to assist the Financial Aid Committee with the issuance of financial aid awards. Continuing families currently receiving financial aid will be given first priority. Adherence to deadlines is essential because funds will be allocated to other families if materials have not been submitted by the deadline. What forms are required when applying for financial aid? Families should fill out the PFS at www.sssbynais.org and submit all tax documents and necessary schedules. In addition, families should fill out Form 4506. This document is available at http://www.irs.gov/pub/irs-pdf/f4506.pdf and should be signed, undated﻿, and uploaded through SSS. Form 4506 is an IRS document that is used to retrieve past tax returns, W-2s, and 1099 transcripts that are on file with the IRS. The document gives permission for a third party to retrieve the taxpayer’s data. When is the deadline to submit 2018 Federal tax returns? A complete 2017 Federal tax return, including all appropriate schedules, must be received by SSS via NAIS by FEBRUARY 4, 2019. A complete 2018 Federal tax return, including all appropriate schedules, must be received by SSS via NAIS at your earliest convenience, but no later than APRIL 30, 2019. If you require special considerations, please contact the Director of Financial Aid. What are the considerations for special situations? The birth parent(s) and guardian(s) must report all income and assets. University School policy for determining the financial need of students from separated or divorced families is derived from the underlying principle on which we base financial aid for all of our students—that is, parents should pay the educational expenses of their children to the extent they are able. In situations where an applicant’s parents are separated or divorced, the term custodial parent is used for the parent with whom the applicant resides (or has resided with most often during the twelve months prior to the application). The other parent is referred to as the non-custodial parent. The Parents’ Financial Statement (PFS), which is submitted to SSS for central processing, is completed by the custodial parent, and if that parent has remarried, by the step-parent. Non-custodial parents are also expected to complete a PFS form and send it to SSS. We will consider the assets of both birth parents before making any award and cannot be bound by the assertion that one parent has disclaimed responsibility for educational expenses. If either parent has remarried, the School will also consider the assets of the step-parent, always bearing in mind that the obligation of that step-parent is to his or her own birth children. It is the responsibility of both parents to submit the appropriate financial information. It is the responsibility of the custodial parent to ask the non-custodial parent to complete the appropriate forms. If the requested information is not provided, the Financial Aid Committee will not be able to review your application. Remarriage of either parent creates a new family unit with new relationships, but we believe that the natural (or adoptive) parents still have a responsibility for educational expenses despite any legal agreements to the contrary. Therefore, the income, expenses, assets and liabilities of the entire new family are considered pertinent to the birth (or adoptive) parents’ ability to contribute to the cost of education. In accordance with this policy, the custodial parent (and any spouse) should file the PFS. The non-custodial parent (and any spouse) must file the PFS as well. Applicants awarded aid and accepting the offer of admission to US will be required to submit a signed copy of their 2017 and 2018 IRS Form 1040, 1040A or 1040EZ with all schedules and attachments for each parent. Information is provided which clearly indicates that the location of the non-custodial parent is unknown. Information is provided that the non-custodial parent has not provided support and has had no contact with the family for at least 10 years. In either of the above mentioned situations, supporting documentation clarifying the situation will be accepted from a doctor, lawyer or other such person with knowledge of the family’s circumstances. There may be other extenuating circumstances which would warrant our waiving this requirement. Grades 9-12 books (books are purchased online; annual costs are approximately $600); before and after school care; optional field trips, such as international trips; some athletic equipment; optional sports fees; and optional club fees. More information can be found on the Financial Information sheet. University School requires all parents to participate in the Tuition Refund Plan. The cost of this insurance protection is included in the annual tuition and fees. Do families have to purchase textbooks? For grades K-8, the cost of required materials - including those used in regular programs in the arts, foreign languages, science and shop - are included in the fees. For grades 9-12, students order books online at MBS Direct. Book costs are approximately $600. This cost may be further reduced by the opportunity to purchase quality used textbooks through our student-run book buy-back program or through MBS. Qualifying book returns are eligible for a refund of up to 45% of the purchase price. Uniforms (except shoes and other specialized equipment) are supplied to members of most varsity, junior varsity, and freshman interscholastic teams. Otherwise, students must provide their own athletic equipment, which may be purchased at the School’s athletic store and billed at less than retail cost. What are our transportation options? Many parents choose to drive their sons to school or carpool with other families. Bus service from some area public school districts is also available. In addition, US offers shuttle bus service between the Shaker and Hunting Valley campuses at no cost. University School provides transportation throughout Greater Cleveland and nearby communities including Bainbridge, Solon, Aurora, Chagrin Falls, Lakewood, Westlake, Rocky River, Bay Village, Twinsburg, Hiram, Hudson, Broadview Heights, Brecksville, N. Royalton, Strongsville, Independence, Richfield, Akron, Bath, Copley, Mentor, Willoughby and Concord. Pricing ranges from $525 to $4,200. Our son shadowed, fell in love (as did we), and we vowed to do what we could within the family budget to make things work. Our family has two incomes; we make a decent living, but we are a household of six, and could only allocate a certain amount of money for each child. We were blessed and surprised to find out that the US awards made it possible for our son to attend the best possible school for his development into a strong, considerate, smart young man with leadership skills and strong morals. The US Merit Scholar Program is an exciting opportunity for current and prospective students entering 9th grade in the fall of 2019. The US Merit Scholar Program encourages the best and brightest boys in the area to join our community. Students with the highest marks and top scores will be considered. Awards range from $2,500 to $15,000.